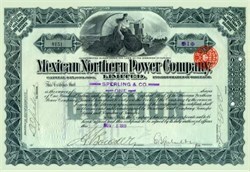 Beautifully engraved certificate from the Mexican Northern Power Company, Limited issued in 1911. This historic document was printed by the Franklin-Lee Banknote Company and has an ornate border around it with a vignette of an allegorical woman sitting with next to a power generator with a light from a lighthouse beaming in the background. This item is hand signed by the company�s vice-president and secretary and is over 90 years old. The certificte also has a three Pence English tax stamp embossed on it.